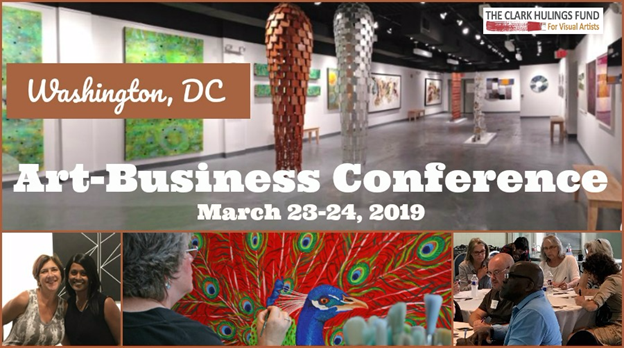 The Clark Hulings Fund for Visual Artists (CHF) is excited to announce its Art-Business Conference in the Washington DC metro area, an event that seeks to inspire visual artists to “Conquer the Changing Marketplace.” This weekend-long business- development workshop will give professional working artists the chance to take a deep dive into the business side of their art careers. Scheduled for March 23 and 24, 2019, the two-day conference is co-sponsored by Artists and Makers Studios, an art center complex dedicated to providing a supportive and vibrant environment for artists to realize their creative goals. The event manifests CHF’s assertion that “Art is a business and artists should run it.” With the art market undergoing rapid and significant change—not only with regard to technology but also HOW art is marketed, bought, and sold—artists need toreclaim their rightful position at the center of the industry. The Art-Business Conference will help them to take charge of their careers, captivate their audience, maximize the extraordinary professional advantages they already possess and sell their art effectively and profitably.